Home > G-sleeve Art > "Being a Kid" Prints by David > "Bike Splash"
The "Bike Splash" print is one of nearly 100 vignettes in the "Being a Kid" series drawn from the boyhood experiences of the artist, David Gildersleeve. This print is based on "actual" events. Click image to enlarge. Boys and water can be inseparable. There is nothing more fun for a boy than riding his bike through the rain, especially if there’s a depression filled with water to ride through. 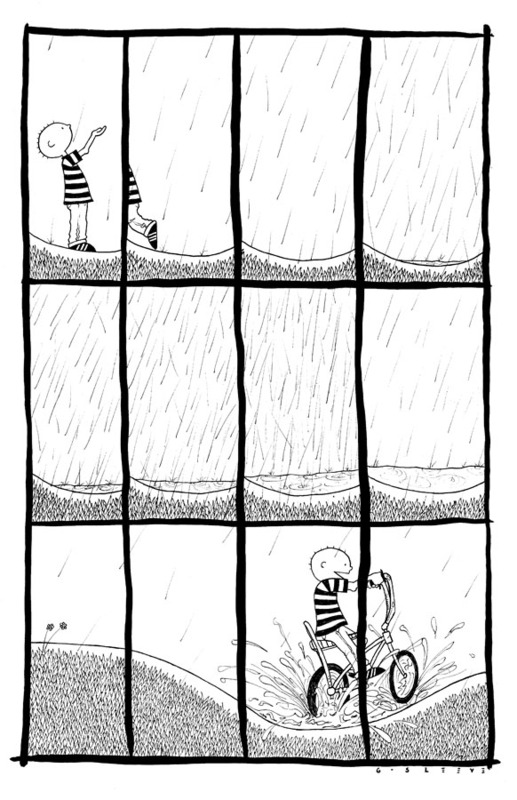 I can understand the joy in this illustration expressed by the kid as he waits anxiously for puddles to form that can be the target of bike riding adventures. Is it really so bad to get a little wet? Kids can appreciate the excitement of finding a pool of water that is there for splashing. Perhaps you did too! This print (11" x 17") is foam-core backed and suitable for framing, and is perfect for hanging in a boy's room. Kids can appreciate the excitement of finding a pool of water that is there for splashing. Perhaps you can also say – "I was once that boy!"